Riley S. Cloth diapered from 3 months to 2 years old. Jocelyn S. Started to cloth diaper at 3 months and still currently cloth diapering. 2. Why did you decide to cloth diaper? Was your decision to cloth diaper supported by friends and family? If not, Why? I always knew I would cloth diaper since I had learned of it. The biggest reason was the Earth! I was always concerned about how much waste a person contributes in a year. Also, how hard could it be? Well, I knew it was more involved but really, was it something I could do? Absolutely! This beautiful planet we live on needs to be here long enough for all here to thrive. My children need to know how fragile our environment is and what they can do to protect it! We all know about recycling and what not, why is using "sposie" diapers so forced in our nation? Even our parents were against our decision. And honestly, we are helping to save this environment but at the same time, we are saving a whole lot of money! How could we not!?! 3. What cloth diaper systems did you begin with? Are you still using those types? I have used quite a few cloth diapers. 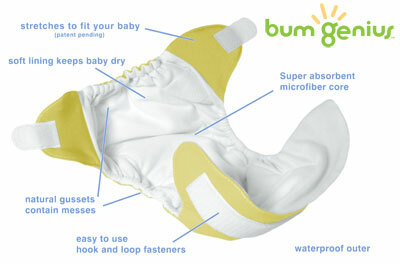 We started out the BumGenius 3.0. Also used the Kawaii. I noticed they were not coming out as clean as I would have expected. I was very unhappy with the results but stuck with them. With my 2nd child, I found Gro-Via. I absolutely love these diapers. They come out very clean in my wash cycle and I'm in love with how you can reuse the shell and just change the soaker pad. The only other thing I use for my diapers is the Tiny Bubbles detergent. This detergent is spectacular! I don't have the fancy gadgets like the diaper sprayer and I don't think I miss it either. I'm sure it works wonderfully but with the GroVia and the Tiny Bubbles, I have no need! 4. Do you stick with one type/brand of diaper, or try multiple? Why? When I started with the BumGenius I wasn't happy and tried the Kawaii. I stuck with them even though I wasn't happy. I wish I had learned of the Gro-Via from the start! With my 2nd I tried the BGs's and Kawaii's again but still, wasn't happy. I will stick to only Gro-Via! 5. What do you wish you would have known when you first started out? I wish I had known of the Tiny Bubbles detergent. I tried many many detergents and spent a lot of money thinking that maybe cloth diapering wasn't for me. And unfortunately after about a year and a half with my first child, I stopped. With my 2nd, I found the Gro-Via and Tiny Bubbles and it was meant to be! 6. What accessories can you not live without? I guess I'm a simple cloth diaper person. I have no accessories. But the Gro-Via diapers in conjunction with the Tiny Bubbles detergent...Who needs accessories!!! 7. How many diapers do you currently own? Are you happy with this amount? At this time I have 8 Gro-Via shells and 12 soaker pads. I'm content with this amount for 2 reasons. First, it gets me through the day. Second, unfortunately I don't have the funds for more shells and soakers. In a perfect world, I would love to have 12 to 15 shells and at least 20 or so soakers. This way I could do cloth diaper laundry every other day. But I'm ok with doing the laundry once a day. I have to keep on top of it though!!! 8. Do you have any cloth diapering tips, secrets, or advice you can offer to parents just starting out? The sun is a magical detergent!!! Even in the winter I put my stained soaker pads on the window sill and the sun does its job! Sparkling white diapers!!! 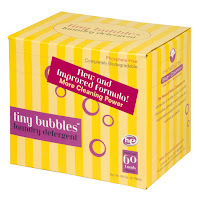 Also, Tiny Bubbles detergent is wonderful!!! I use it for the baby clothes too! 9. Which of our in-stock diapers can we send you for being customer of the month? Why did you choose that particular one? If I were lucky enough to be included...I would absolutely love a Gro-Via Mod Flower hook/loop! Thank you, Holly! Your wisdom will help other parents. Thanks Jen C! She is beautiful and unfortunately this picture does not due her justice! This was the only pic I had of her in her Gro-Via and she was cranky and needing her formula! Maybe when I get the new Gro-Via I'll send another pic out, but I'll make sure she is her normal smiley self!!! Thanks you for sharing! I love Grovia too!